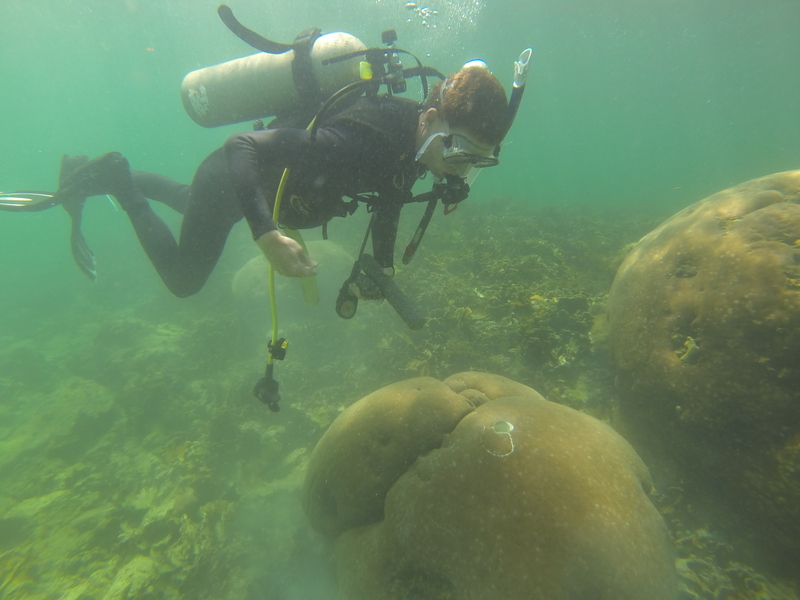 As those of you who follow myself (@jbaumann3), the blog (@underthecblog), or my lab (@castillocorals) on social media may know, our lab has spent the better part of our summer in field collecting coral cores. The coral cores in the image above were extracted from various reefs across the Florida Keys. Before I tell you about what they can help us learn, we should first talk a little bit about the coral. For those who are not marine scientists, corals are an animal. Not a rock or a plant. If you thought either of those things you weren’t entirely wrong. Corals lay down a calcium carbonate skeleton, which is akin to limestone (a rock). Corals also harbor a photosynthetic symbiotic dinoflagellate inside of their tissue (let’s just call it a plant-like algae from now on though, ok?). Alright then, tropical corals build reefs, which are great if you are a baby fish or a small bottom dwelling creature who likes to hide from predators. Just how important are coral reefs? Let’s just say global fisheries would pretty much collapse without them (they are struggling with them, so imagine what would happen if reefs were gone). The GDP of many tropical nations is highly dependent on reefs as they bring in money from tourism and provide seafood as an export. Reefs are a big deal. So, how exactly do you core a coral? Step 1: Acquire a big hydraulic drill, a compressor and power source for said drill, tons of underwater hydraulic hose, and a team of scientists with scuba gear. 3.) Drill the coral all the way through to the base (adding more drill bit pipe as necessary). 4.) Extract the coral core! 5.) Now we have a coral at with a hole in it. Certainly that isn’t good, right? The triage team is tasked with filling the hole (we use a concrete plug that is the same length of the core we extracted). 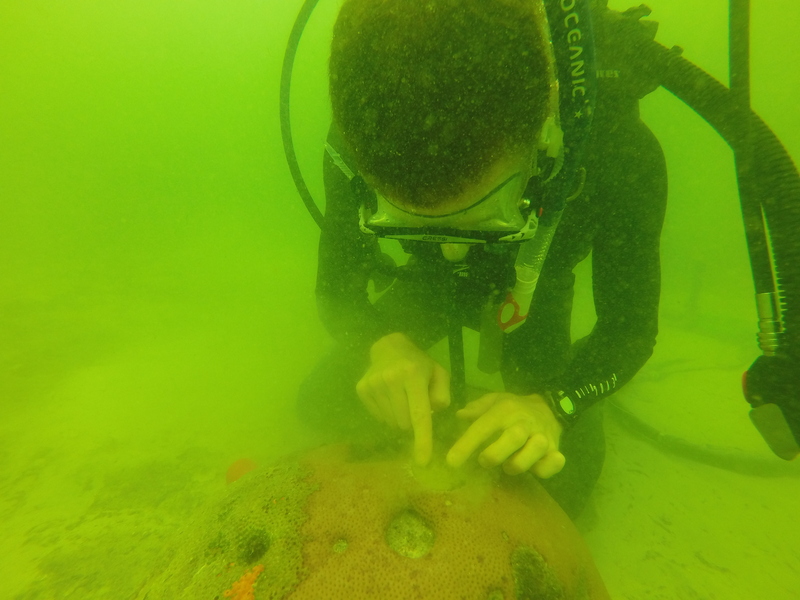 The hole needs to be filled to keep any pesky organisms from getting in there and destroying the coral from the inside out (we call these bioeroders). 6.) After the concrete is inside the hole, we seal it with non-toxic marine epoxy. The seal keeps bioeroders out and allows the coral to grow over the hole and heal. 7.) 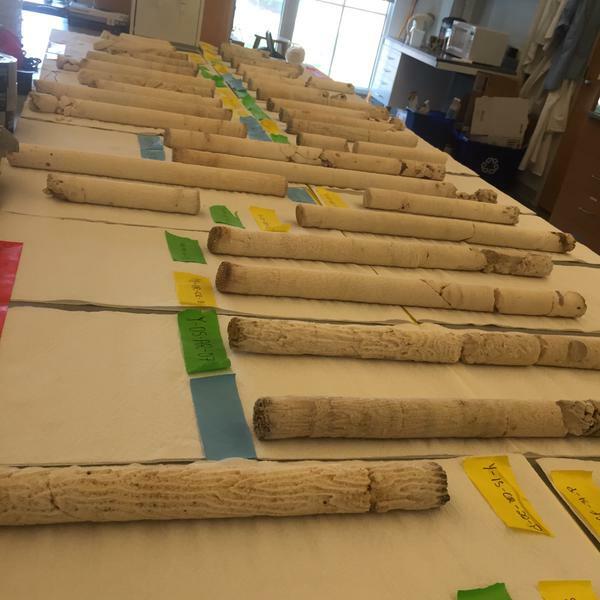 Transport coral cores home to UNC, CT scan them with the help of medical imaging professionals, and then analyze the growth bands. 8.) Age the coral, measure growth rate across years, and compare with satellite and in-situ temperature records. Corals grow kind of like trees. They lay down a series of bands that allow us to see how old they are. These bands (one light band (low density, fast growth and one dark band (high density, slow growth) per year can show us how much the coral grew each year. We can even dig deeper and use more precise methods to figure out seasonal and even monthly or weekly variations in growth! 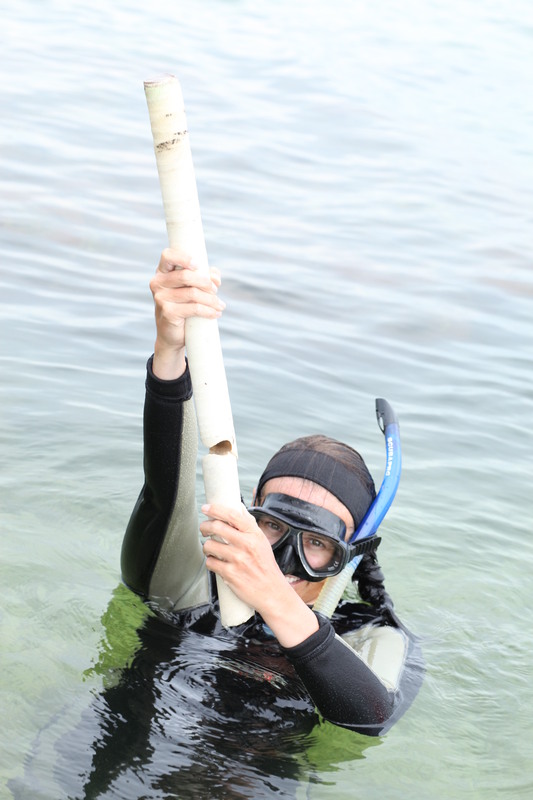 Coring a coral allows us to see the banding in a given coral. We can then analyze growth, correlate it with historical records of sea surface temperature (usually from satellite measurements), and identify how changes in temperature affect coral growth. We can even take this one step further. The coral skeleton contains isotopes, which we can use to identify the chemistry of the surrounding ocean at the temp of skeleton deposition. If we have a coral core that dates back to 1850 (before satellites), we can determine the pH and temperature of the seawater at the time of deposition. 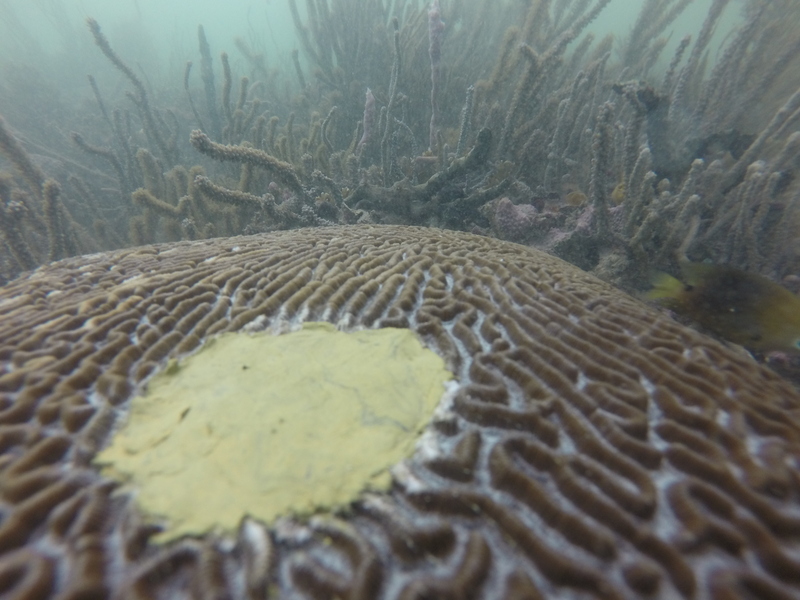 The usual culprit for slower growth are things like increased water temperature (warming) that can lead to coral bleaching (stress on the coral). Corals can also grow faster or slower for other reasons, including just because (they are animals after all and biology is pretty confusing). However, with a large enough sample size and plenty of measurements, we can pretty much figure out why growth rates are changing. That is out goal here in the Castillo lab. 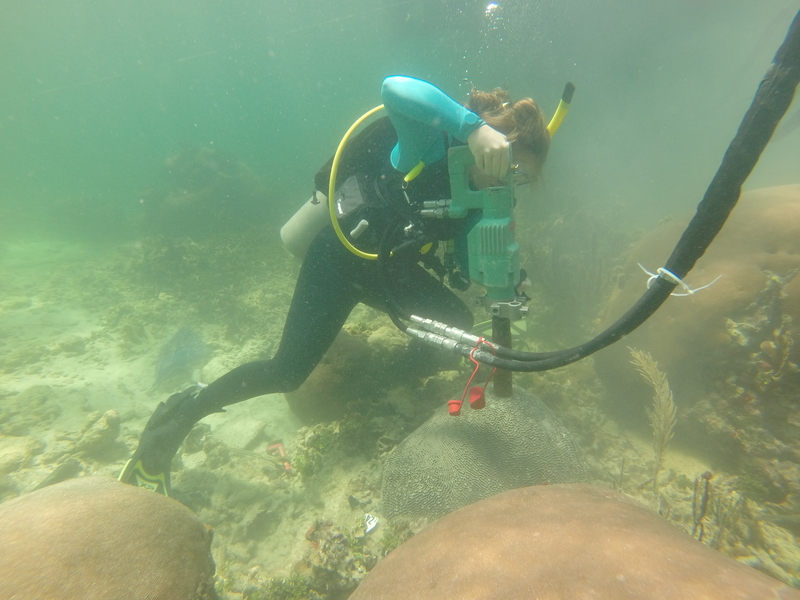 Our newest project is examining the growth rates of massive corals throughout the entire Caribbean in order to asses the health of reefs across the basin. This project will continue into 2016 and I will be adding additional information as we go, so check back on occasion to see our results! Tags: #COREal2015, Climate change, Coral, coral reefs, geology, Marine Science. Bookmark the permalink.